If you’ve been following along on Instagram over the last month, you know that throughout January we, along with my amazing parents undertook what was basically a month of home projects and updates for an impending project that ran the gamut from small DIY home decor pursuits to planting/landscaping to painting to kitchen countertops and so much more. And I have to say, much to my own surprise and despite my slight skepticism that this crazy one-month deadline we’d given ourselves could cause some of these projects to crash and burn, it all went shockingly well! Teamwork makes the dream work… as do parents that are basically saints. And as a result I’ve officially decided that slightly ridiculous deadlines might just be where I thrive. So today, we’re kicking off a fun string of home-related posts to show you what we’ve been up to, starting with our favorite of all the updates, our brand new kitchen countertops… that we’re officially in love with! We’ve been dreaming about a new look for our kitchen countertops for a while now that we just couldn’t get out of our heads. We fell in love and only got more attached to the idea as time went by and as our Pinterest scrolling went deeper and deeper. The gist? Wood countertops. 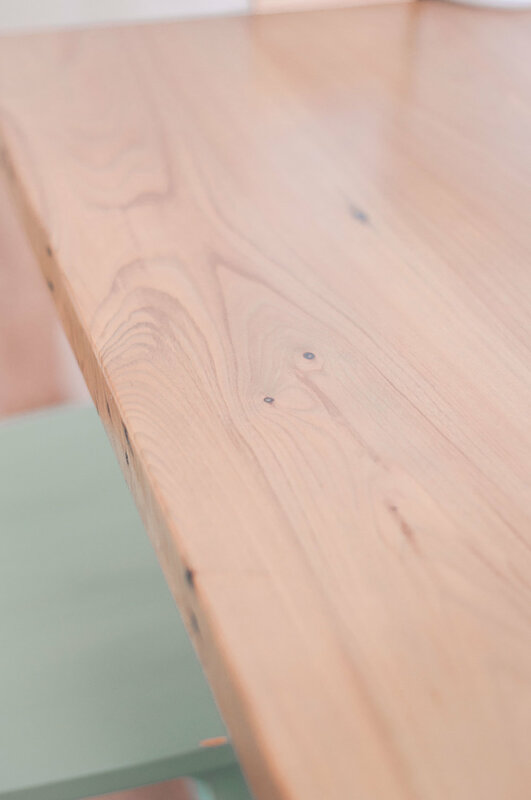 And not just any old butcher block countertops, but wide plank (face grain) wood countertops that would warm up our kitchen and give it that casual, lived-in, cozy-cottage-farmhouse feel. And at first we thought we might give it the old college DIY try, but as we talked more and more about the logistics of the project and the prospect of tackling this ourselves, we decided that it was just too important a project to try to DIY with basically zero experience with this kind of project under or belts. We’re always game to give something a go, fail and learn some valuable lessons along the way that empower us in our future DIY pursuits, but we just weren’t willing to do that with our kitchen countertops and wanted to make sure our vision came to life correctly, that the craftsmanship was where it should be and that the countertops were built to last. We know our limits, and though we may have achieved the look we wanted by DIYing this one, we weren’t confident we’d build them to last especially since the kitchen is basically our most used room in our home. Click HERE to see our kitchen throughout the years and prepare to be SHOCKED! The original look that we fell in love with came from My Simple Home’s stunning country cottage kitchen, which can be seen in the pic above on the left. Basically 2'“ x 10” reclaimed woo boards that ooze that perfectly imperfect rustic look. We loved the thickness of the boards, the lighter, cooler color and the idea that functionally, this approach would allow us to not have to be so precious with the countertops. As we all know and as everyone kind of warned us when we talked about this idea, when you have wood countertops of any kind in your kitchen you have to be a little bit more careful about what you’re setting and doing on top of them, which isn’t always easy. With this look, we thought the wood would wear well and allow us to not be as concerned with every imperfection that appeared over time. A ding here or a mark there? No prob - it only adds to the charm! But then as we started to dive into this idea more and figure out how we would get these countertops fabricated, we realized that over time, we might tire of a look that rustic in our own home and that something just slightly more polished might be a better fit. Nothing too glossy or character-free, but something more in the vein of the pic on the right, via Rock My Style. When we finally got our act and our thoughts together and decided that we needed to get serious about finding someone to fabricate and install these if we wanted to make our January 30th deadline, we searched and searched the Phoenix area for someone that was game to fabricate something other than end or edge grain butcher block, which wasn’t as easy as we thought it would be. Luckily, we stumbled upon Old Sol Lumber in Mesa, which specializes in reclaimed wood, vintage lumber, reclaimed barn wood and specialty-aged wood imported and reclaimed into Arizona. We weren’t sure if they could or would fabricate for us, but what we did know was that they’re open to the public so we could at least go and see what they had going on in that warehouse of theirs. Hey, it was a start! And much to our surprise and delight, when we arrived at Old Sol we met the nicest, friendliest, most helpful and knowledgable guy named Corey who immediately welcomed us in, encouraged us to look around at their massive (and beautiful) selection of wood and talk through our project with him. Our kind of place! And as we chatted with Corey and told him about our vision for our kitchen countertops, he was so enthusiastic about it and told us that they also have a huge fabrication and installation counterpart to their business called Brothers Woodworks right next door. Score! At Brothers Woodworks they do all sorts of custom fabrication, including cabinets, countertops and more. And when we say that walking around the Old Sol and Brothers Woodworks shops is a cool experience, that may just be the understatement of the century. If you’re a home decor and design dreamer, this place is heaven! After we left, we chatted with Corey a little bit more via email about the project, and once we decided that we definitely needed Old Sol and Brothers Woodworks in our corner, he told us to come in and nail down the details with one of Brothers Woodworks and Old Sol’s owners, Preston Brown. Conveniently, they open at 7am, so C and I could head down there before work one day and kick this thing off ASAP! When we got there, Preston and Corey talked through our ideas and the process, and helped us hone in on exactly what we wanted these countertops to look like through a series of fabrication options that Preston presented… that were totally mind-blowing and all completely new to us! The best part? The sky was the limit and we loved that. First he had us decide just how much character in the reclaimed wood we wanted them to keep throughout the fabrication process, which would dictate how much they’d plane and sand. Would they be completely character-free and totally level, or would they sand and plane less for a look more like what you see in the My Simple Home pic? Then he mentioned that sometimes when a client is going for a “country” look they’ll use a method called “pillowing” which creates a slight U shape between planks, instead of completely flat and level at the seams. Then we needed to decide on a stain and finish/polyurethane look. So. Many. Decisions. And although all of these choices were new to us, it was so helpful to see the different looks in action around their shops to get a feel for what they were talking about. Ultimately, we decided that we wanted to be able to see a lot of the character in the wood like nail holes, notches and the unique grain on the face of the boards as well as the edges, while keeping the face of the boards relatively flat and ridge-free and leaving the edges a little bit more rustic and untrefined so you could not only see, but feel the character (which you can get a sense of from the pics). We also decided that although we thought the look was so cool, we didn’t want “pillowed” seams in favor of a slightly less rustic look that we think might be a little bit more timeless. Then we landed on using a more grey-brown stain that would mesh with our floors without perfectly matching, and a satin poly finish that wasn’t too glossy, but would still offer us some much-needed protection. Again… decisions decisions! Once we had a plan in place that we were really excited about, the guys got to work, brought us a couple of sample boards a few days later so we could see and feel what they came up with based on all of our choices and they nailed it! Then, much to our shock and awe they fabricated the countertops in about a week and a half and came to install right before our deadline hit. And when they installed, my dad and I got to sit and chat with them while they did their thing and we were both absolutely blown away by the craftsmanship and care in everything they did. As they went in, we realized that the countertops were even more beautiful than we’d imagined and that it was clear that so much time, effort and care went into fabricating and bringing our vision to life. They even added metal braces to the bottom of that little overhang where the mint stools sit so it would stand up to any kind of weight or pressure anyone put on it. For the record if you come over to hang out, definitely don’t sit on our countertops or Hamlet will have to take you outside and settle it! What’s more, when they were installing the countertops and the little wood trim or “backsplash”, they were so meticulous and thorough with their work. The lines are perfect, the caulk on the trim is flawless, every seam disappears and when they were gone, the guys left no sign that they were even here except for these beautiful countertops that we couldn’t love more. As most of you probably know, despite your best efforts to vet it’s just a fact of life that not every contractor you work with on a home project over the course of your life will be awesome. So when you meet a good one who listens, executes with care and is a total joy to work with, you file that away in your heart and tell all your friends… which in this case, is you guys! And as you can see we decided against doing wood on the small piece of countertop surrounding the sink, and that decision was made purely based on our own nervousness that at some point, the water and wood combo would be at odds and the relationship would end badly. In light of that nervousness we decided to take the safe route and do quartzite back there and yet again, we were so pleasantly surprised by the experience there! We worked with JDM Countertops on that portion of the countertops and not only were they very reasonably priced compared to other bids we received (don’t even get me started on that… it’s crazy how much bids can vary on these projects and in our experience, prices doesn’t always equal quality of work. Sometimes it does, and sometimes it all just feels so arbitrary), but they were extremely accommodating to our totally unreasonable timeline and happened to have this really cool piece of quartzite remnant sitting in their scrap yard that was just what we needed. We really wanted to use quartzite (durability) and also wanted something that was mostly white/grey, but also had a little warmth or brown/tan in it that would pair well with the wood. And the character in this particular piece is just so awesome! It was fate. We also updated our faucet because our previous faucet, as pretty as it was, just wasn’t cutting it on the functionality front. Not enough range for our massive sink. So after more deliberation than I’m sure was necessary we decided that this matte black Kraus KPF-1610MB Bolden Kitchen Faucet, 18 inch was the one (it got overwhelmingly positive reviews on every website that sells it) and I have to say, it’s just another thing we’ve fallen in love with. I don’t feel like I can give it a totally thorough review right now, though because I feel like you have to use a faucet for several months or even a year to really get an accurate sense of quality, functionality and durability, so I’ll update you guys about that at a later date. But so far, so good! So there you have it, guys! We’re dying to know what you think. Are you into the new look and the countertops we chose? Also make sure you drop any questions you have about what we did in the comments section below - what’s more fun than talking kitchen countertops? !